Filmed in the real world on public water. Lance catches wild browns and rainbows, and shows you how to do the same on your home waters. 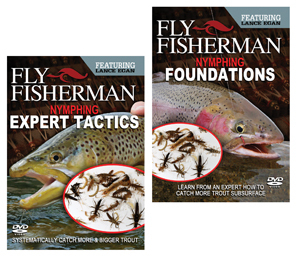 With multiple camera angles shot in HD, you'll see every perspective that will make you become a better nymph fisherman. ABOUT LANCE EGAN Lance Egan is a guide and competitive fly fisher who has participated in six different world championship events. He is one of America's most accomplished anglers, and he can show you how to catch more fish subsurface. DVDs are 60 min each.